I have signed on and been accepted for for the CQJP2012 challenge! Since one of the goals of the challenge is increase awareness of crazy quilting I had better explain that CQJP2012 is an abbreviation for Crazy Quilt Journal Project 2012. 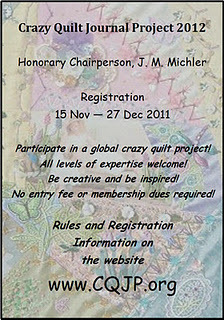 The aim is to complete one crazy quilt block each month and registration is still open closing on the 27th December 2011. Pop over check this challenge out as I think its going to be one of the best we have seen as an online community. Lots of really good crazy quilters are signing on to participate. Blocks will be published on the CQJP blog. This means there will be a steady flow of great inspiration for crazy quilters but more imporatantly the results will expose the public more to the rich history and many techniques of crazy quilting. I am constatnly amazed how quilters who are extremely well educated about the tradition of quiltis and textiles have gaps in thier knowledge when it comes to crazy quilting. Let’s hope this sort of exposure orchestrated by a community of active stitchers helps to counter ignorace of what is possible with this type of quiltiing. Also hopefully people will see it as extremely enjoyable! What other needle work technique do you get to play with so much fun stuff! I may do some pre-piecing of 8 inch blocks but aim to take it block by block. Along the way hope to push my skill levels a bit, try differnt techniques but ot so much I fall too far behind. It is shaping up to look like an interesting new year! Hmmm. . . This project sounds interesting but I know from past experience that I probably won't keep up with the challenge. It would be a great way to use new stitches from TAST but I feel too inexperienced for the project. Will have to think more about it especially since I want to work more with colored pencils next year. I would like to join TAST 2012. I, too have signed up for this. It should be fun. I plan to use the TAST on some of the blocks as well. I love two for one! Looking forward to this challenge. I am doing this as my first CQ project, alongside my mum, who is a seasoned crazy quilter. I really look forward to seeing what people come up with and learning new techniques as part of a vibrant online community. Although I WILL NOT sign up for any more challenges for the next tweove months, I will be keeping an eye on this one as I do my own version of crazy quilting and will enjoy looking at others' work and, hopefully, gaining some extra inspiration along the way. Hi Sharon, Yes I too have signed up, I'm making a Tree Skirt for my Christmas Tree next year. I've been trying to promote Crazy Quilting here in Townsville since I returned home from England 2 years ago (yes it's been that long already), and have finally feel I'm getting somewhere. The Townsville show society have put in a class for Crazy Quilting, so good to have that finally.